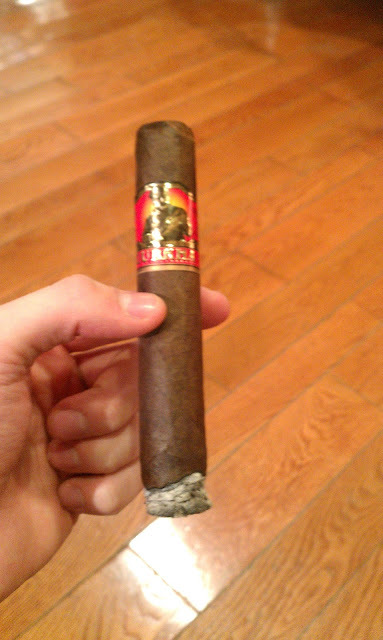 Appearance (0-20): From a long line of Gurkha products, this one previously has been a solid stick. It’s 6x60 size is in line with the Beauty, Titan, Beast, and many more. The maduro wrapper wasn’t as dark as I remember, but it looked good. The band really lacked here, and was just the plain old Gurkha label. Previously, it came with a 3” cedar wrap on it, but this crop didn’t have it. Construction (0-20): Upon lighting, the cigar burned well and had a nice ash to it that held for an inch or so. It felt a little soft and not fully packed, but then again it’s a 6x60. If you have a fully packed 60 ring cigar, you might need a weekend to smoke it. The draw was very good for this reason, and gave off a great volume of smoke. No visible blemishes or veins. Strength (0-20): Dropping down to the flavor profile, there were some hints of spice and pepper that gave this a small kick to it. I enjoy the strength of a nice maduro wrapper, and this was a solid med-full stick. Flavor (0-20): The flavor profile has always been the most important part of a cigar for me. This one is very complex and moves between a variety of flavors including cocoa, woody, spice, earthy, and cream. I did enjoy how it tasted, but I can tell that this is not the same crop that I’ve smoked before. 2 years ago I had the same cigar, but a totally different experience. The cigar back then was downright amazing, and it would get a 20 in flavor. Also, the wrapper was much darker and gave off more pungent notes. Unfortunately once you expect that, you are somewhat let down with a new crop. I luckily still have 2 of the old crop saved in my humidor, so I will review them in a few weeks. Value (0-20): As with every Gurkha cigar, singles are overpriced. I would never buy a single, but always snag them in sampler packs. I snagged a 5-pack on CigarBid for $10. I personally would not recommend paying retail for this, but it’s a good stick for $6-8; especially for the size. Not to beat a dead horse, but I’d choose many other sticks over this for $11 retail. Additional Notes: Paired with Sam Adams Alpine Spring. Smoked at Cigars International. Overall (0-100): Gurkha seems to be hit or miss with many cigars. I believe they are truly a victim of their own success. Personal opinion is that they tend to overproduce and have made their product line so large that they don’t even know all the cigars they manufacture. I do enjoy their 6x60 sticks mainly, but this one (this years crop) seemed to lack in flavor for me in comparison. Although if you never smoked one before, I believe it will be a solid stick for anyone at the right price (refer to value section). Final thought: Although I really enjoyed the cigar, it got a low rating due to lack of band art and a tough value. Unfortunately, I need to rate it off of retail price.